We all have been through the situation when you try to focus studying but people talks out loud and disturbs you. Or when you have a final that you have to sleep but your roommates ignores quiet hour policy and starts yielding In the game channel. Maybe you are too shy or it's simply embarrassing to ask them to quiet down, so we build this device which friendly reminds people to respect the common space. A simple design, but solves big issues! The device checks different noise level and flashes LED with different frequencies to alert and friendly remind people. 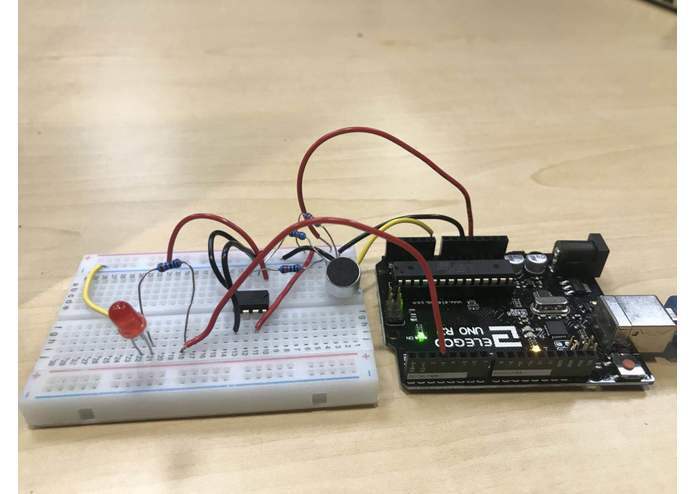 It uses a microphone to take analog value and using MATLAB through linear algebra to find equation to describe the relationship between adc value with actual dB value. Then setting conditions to flash LED at different frequencies, the higher noise lever, the higher frequency LED flashes. The microphone was inaccurate and unable to provide accurate response with different noise level. We had to try place the microphone in different positions and run multiple trials to obtain accurate data set to derive the equation of conversion. We are proud that we are able to get a prototype of a device that help solve not only my personal issue, but a common problem among many places to ensure a quiet and comfort environment in library, dorms, even classrooms. When we have issues or problems in our life, think about it and give it a try to solve it! We learned how to handle data when the sensor is not accurate by double checking the setup and number one thing is to have patient! Because it's frustrating! We are looking forward to add a speaker(which we didn't find at this hackathon) that "beeps" when high noise level to further remind folks about the importance of quietness. Adding Bluetooth and apps on phone to adjust the working hours and desired noise levels.